Time to sell your home in Blakeley Forest? Read about today's buyer. Blakeley Forest is a beautiful tree-lined subdivision with estate sized homes located off Highway 225 in beautiful Spanish Fort, Alabama. Homes in Blakeley Forest range upward in size from approximately 2400 square feet of living area, with most homes being larger. 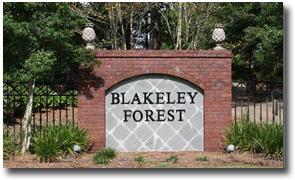 Blakeley Forest is a wonderful subdivision offering scenic tree-lined roads. A drive through this neighborhood reminds you of the days of Scarlett O'Hara. The streets are named with "Gone with the Wind" themes such as Rhett Butler, Tara etc. The neighborhood offers privacy in a very convenient location. Blakeley Forest is in close proximity to shopping, dining and schools. Houses in Blakeley Forest range upward in size from approximately 2400 square feet of living area, with most homes being larger. Please let us know if you would like further info for Blakeley Forest or any other homes, properties or real estate in the Spanish Fort area or would like to schedule a private viewing by emailing info@condoinvestment.com or by calling (251) Area-Pro (251-273-2776) for immediate assistance.